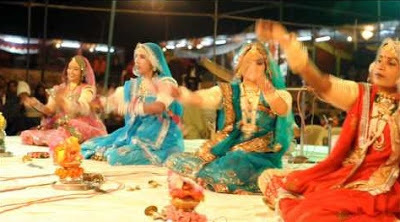 Terah taali Dance, Rajasthan: Terah tali dance is performed by women and is considered as a devotional form of dance. Manjeeras are tied on the wrists, elbows, waists, arms of the performers. The sounds of these Manjeeras produce the Terah Taal or the thirteen beats. The women with dexterous and fine movements dance at a strong rhythm on beats of `Manjeeras`, whereas, the male partners sing and play on the `Tandoora.` Terah taali a devotional dance form performed by the Kamad community in honor of their folk hero Baba Ramdev.